There is no doubt that web [Rest] APIs have become extremely popular and its usage has gone well beyond just building APIs in support of mobile apps. We can see the adoption of resource-oriented architectures (ROA) by probably all SaaS vendors who provide out-of-the-box APIs as the means to connect and interact with their cloud applications. Take for example the Oracle Cloud. To discover and consume publicly available Oracle SaaS APIs, all one need to do is browse the Oracle API Catalog Cloud Service (which is publicly accessible) and just select the Swagger definition for any given API. But (as you probably already know) the adoption of web APIs hasn’t stopped there. With the increased popularity of Microservice Architectures , initiatives such as Open Legacy , and node.js based frameworks like loopback and sails (to name a few), API-enabling system of records is becoming a lot easier. Luckily for many Oracle’s customers and Oracle Fusion Middleware / Oracle PaaS practitioners like myself, with the latest release of Oracle SOA Suite (12.2.1) , one of the many new features introduced is the support for handing JSON end-to-end. I don’t want to understate the importance of this as with such feature it is possible to use BPEL for example to orchestrate several APIs (all in native JSON and also in-memory with the new SOA in-memory feature) and therefore deliver coarse grained business APIs that actually perform. For me this represents an important milestone for Oracle SOA Suite as it shows the departure from traditional SOA tech-stack and into SOA 2.0 (as I like to call it) as the suite is now better suited to support the adoption of ROA, microservices, IoT, and so on. Having worked with SOA Suite since 10.1.3.1 this is very exiting. Read the complete article here. At Oracle OpenWorld 2015, Samsung Electronics is showcasing premier enterprise solutions created for Samsung’s top-rated mobile devices and developed on Oracle’s industry-leading architecture. 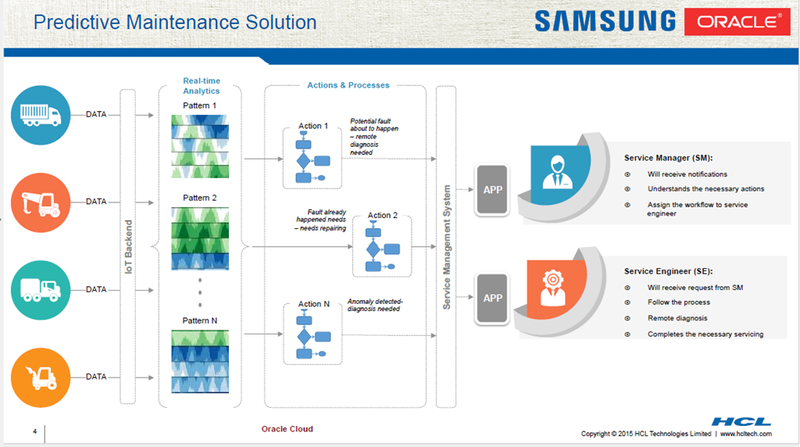 Together, Samsung and Oracle are improving the end-user experience by delivering solutions unique to Samsung devices and Oracle Mobile Cloud Service. From smartphones to tablets to wearables, Samsung and Oracle are driving enterprise mobility and enabling professionals to be more productive. The new Cordova plug-in for Samsung developers, also on display at Oracle OpenWorld, makes enterprise app development easier through the packaging of key APIs for one of the best Android business experience on the market. The Cordova plug-in integrates into Oracle’s developer tools, while granting access to Samsung’s unique hardware features such as multi-window and S Pen. Digital transformation is at the core of every business strategy regardless of what type of business an organisation is in. Companies that embark on a on a digital transformation journey are able to create innovative and disruptive solutions that are capable of delivering a much richer, unified and personalised user experience, at a lower cost. They are able to engage the customer in a seamless fashion through many channels such as mobile apps, responsive websites and social media. Organisations that adopt innovative digital business models gain considerable competitive advantage over those that don’t. The fundamental driver for digital transformation is the ability to unlock key information assets and business functionality, which is often hidden inside an organisation’s enterprise systems and in SOA based web services which are only internally accessible. To materialise these assets, organisations need to build web based Application Programming Interfaces (APIs) that not only provide standard, lightweight web access to these assets but also do so in a secured and controlled fashion. The lightweight nature and ease of use of these web APIs, ensure that they soon become the main mechanism for accessing information and functionality that is needed to build mobile applications, responsive websites and other cloud based solutions. API management is the discipline that governs the software development lifecycle of APIs. It defines the tools and processes needed to build, publish and operate APIs including the management of the community of developers around it. Read the complete article here. Want to see a showcase of the brand new Oracle Internet of Things (IoT cloud service consuming Mobile & Process and Integration Cloud Service? Make sure you visit the Samsung & HCL Demo center at Moscone Center South Exhibition Hall – Booth 1221. The use case includes the complete flow from fault recognition, gather and diagnose information, repair and settle and schedule preventive maintenance. The whole show case was build on the Oracle PaaS Platform. For more information or in case you can not make it to San Francisco please contact Luis Weir here. In this article I will talk about my first conclusions and my point of view regarding Microservice Architectures. As there is still quite a lot of confusion and debate out there on this topic, I will try to describe with my own words what Microservice Architecture is, how does it differ from typical Service Oriented Architectures (SOA) and what design principles and practices governs it. The article overall it’s a fantastic piece of work (really suggest you read it). The way Microservice Architectures it’s defined opens up a few pandora boxes (in a good way I think) which I will talk about subsequently. First of all, if you are familiar with SOA and it’s guiding principles this will seem very familiar (read for example: http://en.wikipedia.org/wiki/Service-oriented_architecture or http://www.soa-manifesto.org/). Yet, if you noticed the highlighted texts, it’s not quite the same as what we are used to in traditional SOA. The truth is, wether we accept it or not, SOA architectures evolved around the adoption of certain design patterns (such as Enterprise Service Bus (ESB), canonical schemas, centralised contracts, -see http://www.soapatterns.org/ for more) and the use of SOA specific infrastructures to build and deploy services and APIs became the approach of choice (note that the service vs API topic it’s not discussed in this post. For my view on this read http://www.soa4u.co.uk/2013/09/restful-is-also-soa.html). One can argue that SOA architectures can also satisfy the listed requirements as SOA it’s really an architecture paradigm that can be realised in different ways. I personally think this myself and I would regard Microservice Architecture as a SOA design pattern, however as per my previous point, comparing it with traditional SOA architecture’s there is a difference. Microservices vs SOA Read the complete article here. Oracle has recently released Oracle Enterprise Repository (OER) 12c and Oracle API Catalog (OAC) 12c.I am particularly exited on the latter as it aims to simplify management of APIs and promises to be able to create catalog of your services and APIs rapidly. 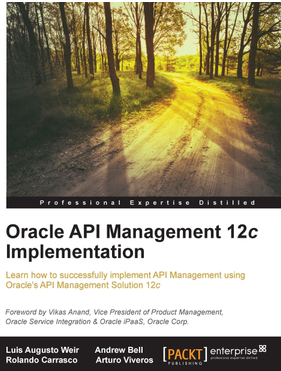 Furthermore, although OER 12c maintains the same richness as in OER 11g, this product is targeted to advance users that are in need to address more complex governance requirements whereas OAC it’s a light-weight version of OER however tailored to address specific use cases of API management such as cataloguing, discovering and rating APIs. This blog is about my first impression when installing, configuring and using Oracle API Catalog. In the blog I provide all steps I followed to achieve these tasks and at the end I provide a summary of my experience and feedback of the product. Firstly install Oracle Database and Weblogic Server as per instructions. Following key screenshots taken during installation of Weblogic Server and OAC and also some tips: Read the complete article here. Having been delivering SOA projects for over a decade, I’ve come across many tools some of which I hate and avoid using them (unless a client demands so) and others that have made my life easier when delivering projects. Project/Scrum Management and Collaboration Jira Jira when used for scrum management is In my opinion is the the best tool I’ve used for managing scrums specially in an offshore / onshore distributed environment. It also has capabilities to manage GIT repositories which makes this an ideal tool for a complete cloud/based agile project with users all over the world. Agilo I used this tool some time back successfully in a large onsite SOA project and it worked very well for us. Product has come along way since then and It’s more feature rich than it used to be. It has a 30 day trial. Trello Very simple, lean and easy to use project/task management and collaboration tool. It’s free for any number of users, can log-in using Google account. Thanks Darren Atkinson for this tip! Coop App very clean UI supporting features such as share status updates, questions, links, and others. PBworks Suite of tools including in-app instant messaging, live notifications of changes to work spaces, live editing of documents, voice collaboration, wiki, and others. Can be used for full collaboration including project management. Configuration Management GitHub I have been using this tool recently but found it amazing specially because of the GitHub client which is not intrusive to filesystem (like Tortoise and that create issues some times in the local file system) and very easy to use. It’s social collaborative capabilities are awesome but also supports private projects however this latter feature it’s not free. Also there are tutorials online. Get all tips from Luis here.